Over four billion people from around the world are using the internet, marking the first time that more than half the global population – 53 percent to be precise – has gone online. This was one of the major highlights of a report recently published by We Are Social and Hootsuite. 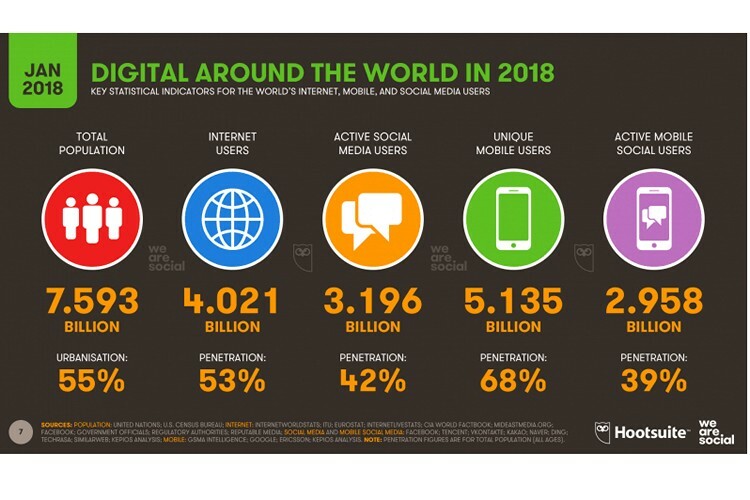 Called ‘Digital in 2018’, the report, which analyzed social media usage and digital trends from 239 countries and regions around the world, reveals some interesting insights into how the world is using the internet. According to the report, social media usage spiked by 13 percent last year, reaching 3.196 billion users globally. What’s interesting here is that an overwhelming majority of internet users seem to be accessing social media platforms from their mobile devices. Mobile social media usage apparently went up by 14 percent last year, with 2.958 billion people – that’s 93 percent of all social media users – said to be accessing these platforms from their mobile devices. The report also reveals the increasing democratization of electronic gadgets, with over 200 million people apparently getting their first mobile devices in 2017. That being the case, more than “two-thirds of the world’s 7.6 billion inhabitants now have a mobile phone”, more than half of which are ‘smart’ devices. The number is expected to rise four percent YoY in 2018, hitting 5.135 billion. Overall, internet user-base grew the fastest in Africa, with 20 percent more people in the continent getting online in 2017. Usage grew significantly even in developed markets like the US, with 16 million people in the country starting to use social media platforms for the first time last year. According to the report, “more than 70 percent of Americans use social media and spend two hours a day on social platforms. Overall, Americans spend 6.5 hours a day using the Internet, 60 percent more time than they spend watching television”. The report also did some crystal-ball gazing to provide us with an even more interesting prediction about global internet usage this year. Apparently, netizens from around the world will spend “a combined total of 1 billion years online in 2018, of which 325 million years will be spent on social media”.